Potent, selective and competitive GABAA receptor agonist and a potent partial GABAA-ρ (GABAC) receptor agonist. Muscimol is a GABA analog with comparable potency to GABA and is thought to act at the orthosteric site at GABAA receptors in varying active conformations. Also acts as a weak inhibitor of GABA uptake but is not a substrate for GABA transaminase. Application of muscimol evokes GABAAR currents and its actions are antagonized by the GABAAR antagonist bicuculline (bicuculline methochloride, methiodide and methobromide also available). Muscimol enhances inhibitory neurotransmission and suppresses spontaneous activity. It is commonly used in reversible brain inactivation studies. Active in vivo and blood brain barrier permeable. Shows psychoactive, memory impairing effects and anticonvulsant actions at high doses. The GABAA receptor agonist muscimol is used at concentrations of 1-50 µM. Muscimol from Hello Bio used at 10 µM led to a large hyperpolarising whole-cell current in hippocampal CA1 neurons (see Fig 1 above). Action of muscimol was fully blocked by the GABAA receptor antagonist bicuculline (100 µM). Neurons were held at 0 mV and GABAA receptor currents were evoked via applying muscimol directly to the recording chamber during continuous perfusion. 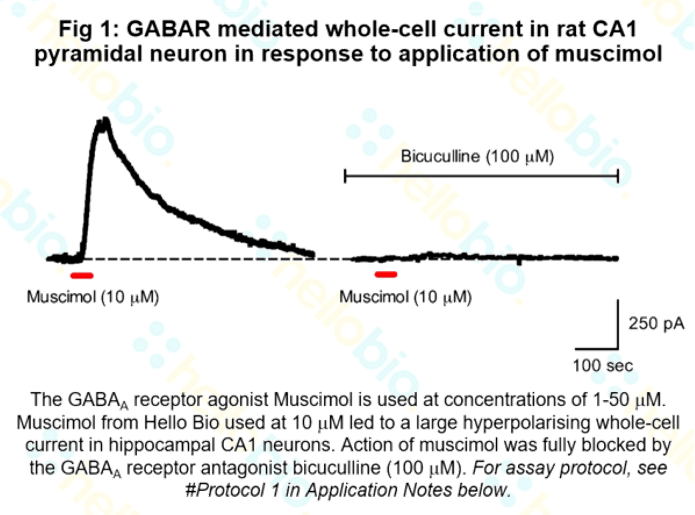 To test muscimol’s selectivity to GABAA receptors the experiment was repeated within the same neuron in the presence of the GABAA receptor antagonist bicuculline (100 µM). Under these conditions muscimol failed to induce a hyperpolarising current. Anticonvulsant and behavioral effects of muscimol in immature rats. Mareš P et al (2014) Brain Res 1582 : 227-36. Muscimol as an Ionotropic GABA Receptor Agonist. Johnston GA (2014) Neurochem Res 39(10) : 1942-7. Hippocampal infusions of pyruvate reverse the memory-impairing effects of septal muscimol infusions. Krebs DL et al (2005) Eur J Pharmacol 520(1-3) : 91-9. 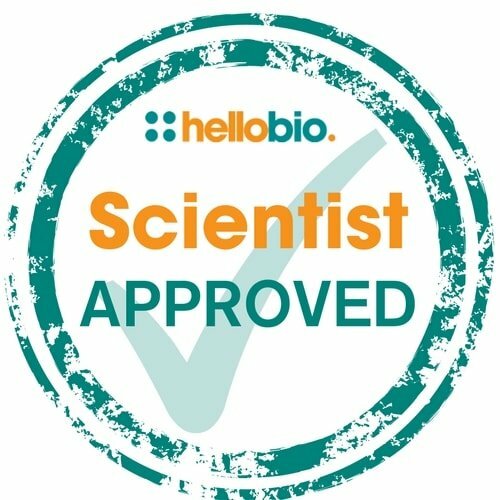 The following papers have cited the use of Muscimol (HB0887) from Hello Bio. If you have published a paper using this product, and it is not shown here, then please tell us! We will send you a free gift as a thank you!